As concerned "cat parents" we all want happy cats, and yet often we question whether our cat is happy. Although every cat is an individual and, like humans, may show happiness in different ways, there are some pretty universal happy cat clues. There are many signs that let you know if your kitty feels joy. Cats literally "say" they're happy. Vocal kitties tell you all about it and engage in long drawn out conversations. Generally, the higher-pitched sounds are "happy" while lower pitched can have a bit of frustration and be more demanding. Quiet cats may express happiness with silence, and vocalizes more to express unhappiness. Confusing, yes! But that's why we love our enigmatic felines! While purrs aren't always happy, for the most part, they can be an indication of feline contentment or even bliss. Kitty chortles and trills -- that "prrrrupttt!" sound many cats make, is a very good indication of cat happiness. There are many eye, ear, fur and body positions that indicate upset cat feelings, or contentment. For example, the relaxed contented cat rests with front paws tucked under, ears forward, eyelids "sleepy" perhaps at half-mast. The eye-blink in return of your stare from across the room is a happy cat gesture. Sudden dilation of the eyes indicates arousal-happiness of a full food bowl, for example, can prompt this reflex. Happy cats hold whiskers slightly forward and fur smooth with tail relaxed. A joyful cat's tail talk stands straight up with just the tip crooked in a "howdy" greeting to people and other pets the cat considers friends. A happy cat shows interest in his environment. He may be the "supervisor cat" with a paw into everything new around the house. Or he may simply watch calmly from a distance. While many cats have a built-in stranger danger default, the happy cat reacts with caution rather than fear. Confident kitties have the highest happiness quotient. Kittens play nonstop and simply don't know any better than to be happy. Playing is a terrific indication of happiness. As cats mature and progress into middle and old age, play activity diminishes. But any amount of play, from rollicking races and kitty wrestling matches to sedate paw-patting of features (or your leg or face for attention) indicates feline happiness. Cats play with other critters (and humans) that they like and trust. 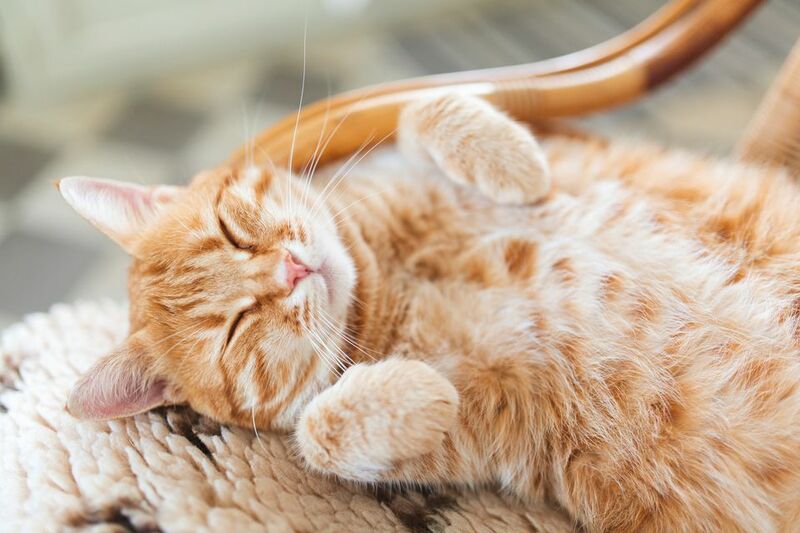 Cats may sleep more when depressed, but their sleep location preferences can be an indication of happiness. Sleeping with other cats, and especially seeking them out, indicates happy relationships with the chosen nap-buddies. If your cat chooses you as a bed-mate, rejoice! That means kitty trusts you--distrust breeds unhappiness, after all. Cats who feel good keep themselves well groomed. Poor grooming is a sign of unhappiness, so when your kitty looks spiffy, that's a positive indication she feels happy, too. Grooming other cats or licking the owner (as with mutual sleeping) also shows trust and a positive relationship. Cats happy with each other groom one another. However, since kitties are individuals, not all cats feel the urge to groom others. Happy cats have healthy appetites. Oh, they may bluff you and train owners into providing special treats or food. But in many ways, this sort of manipulation can become a game that falls under the "play" category. Do We Know the Reasons Why Cats Purr? Is Your Cat Trying to Say They Love You?